You know how you can insert a capsule into an espresso maker and get coffee on demand in your home? 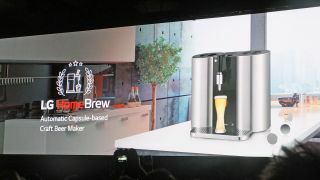 Soon you'll be able to do that, but with beer, thanks to the new LG HomeBrew. LG claims it's as easy as that – the machine will even clean itself when it needs to. There's an app to tell you when the beer is finished brewing, and it should be capable of five liters of beer within two weeks. The machine is capable of five different types of beer, which are American IPA, stout, Czech pilsner, American Pale Ale and Witbier. The company has partnered with UK-based brewery Muntons to make the capsules, but exactly how much these will cost individually remains unclear. An exact release date or price for the LG HomeBrew has yet to be announced, but rest assured we'll be reviewing this machine as soon as we possibly can. For anyone who wants to brew their own beer at home but doesn't want to spend time messing around with hops and flavors, the LG HomeBrew may be the perfect new addition to your kitchen.